As most of you know, I recently returned from Wrockstock V at Trout Lodge in Potosi, Missouri. Wrockstock has always been wonderful, but this year, it was magical. Just four years ago I attended my first Wrockstock weekend. I was just beginning to get interested in Wizard Rock, and didn't really know much about the genre. From what I could tell, a lot of the bands were made up of cute boys and their acoustic guitars. When I arrived at Trout Lodge for the first time, I was in for a big surprise. It turns out that The Remus Lupins, The Whomping Willows, and Draco and the Malfoys were much more than a one-man acoustic band! Add JFF to the mix, and I was completely blown away. It was the best Wizard Rock festival I had ever attended. I was inspired and in love. Later on in the weekend, over a hilarious game of Apples to Apples, I confessed my crushes on the boys of Wizard Rock to my cabin mates and new friends. It seemed I had turned into a big, giggling, fan girl. Feeling more comfortable after my confession, I decided to share something else that I had been keeping secret: I had always wanted to start a Wizard Rock band. 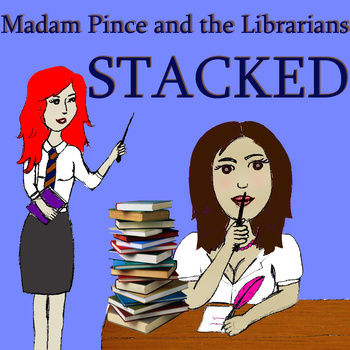 I blushed as I told everyone that I would name my hypothetical band Madam Pince and the Librarians. I grinned nervously and waited for laughter. What I got instead was something amazing. One girl looked at me seriously and asked: "Well, why not?" I blinked. I had no answer. A seed took root in me that day, as I envisioned becoming one of the wizard rockers I so admired. The next four years brought hard work and collaboration first with Erich Brandkamp, and later with Kelly Foulds and Stacy Pisani, we recorded an a full length album and a live EP, as well as appeared on several Wrock compilations including Jingle Spells 3. 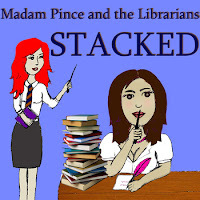 Madam Pince has also performed in an array of venues including the legendary Sidewalk Cafe, Evil Day II, Sonorus, Infinitus, Aeternitas, the New York City Wizard Rock Festival and more. We've opened for Swish and Flick, Diagon Alley, Ministry of Magic, Harry and the Potters, and many other amazing bands. Each time Madam Pince took the stage, I felt empowered. 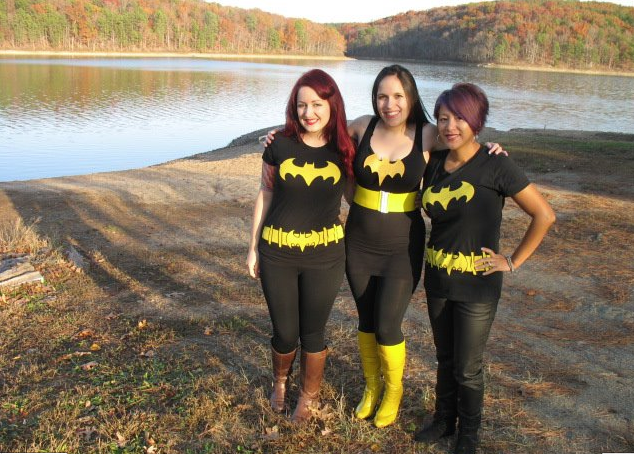 We were making it in the wizard rock fandom and it felt great. The first time I sang on the Wampum Willow side stage, it felt surreal. 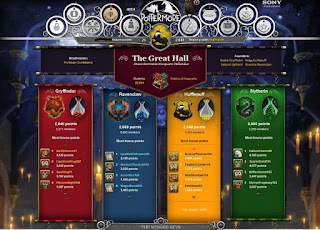 This year, when Brian called to ask Madam Pince to perform on the main stage, I cried. It was the biggest honor I could ever imagine. We had been asked to play on the very stage that helped me fall in love with wizard rock in the first place. When we performed a cover of Make Your Own Kind of Music, and the audience draped their arms around each other and sang along to Mama Cass' timeless lyrics, I was so moved. My eyes teared up as they scanned the sea of smiling faces, the expressions of love and support washing over me as we finished our set to welcomed cheers of "one more song". I grinned with gratitude as we once more took the stage. We closed the set with the first song we ever wrote: "No Squeeing in the Library". With Kelly on guitar and Stacy on drums, it was incredible. As we left the stage to cheers and claps, a smile spread across my face and the tears flowed freely. Standing on that stage with two of the most amazing and strong women I know, and with so many supportive friends in the audience, brought on intense feelings for which I was not prepared. Overwhelmed with emotion, I gathered my band mates in a fierce hug and thanked them for sharing this journey with me. We had come a long way from a seed of an idea in my head. 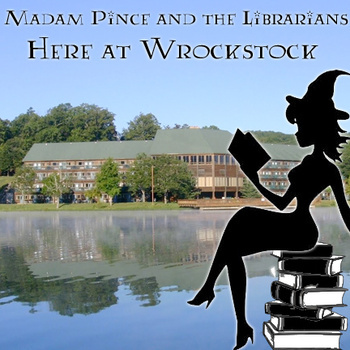 Madam Pince was real, and it was all because of Wrockstock and the loves and friendships it sparked. Thank you so much to Abby Hupp, Paul Johnson, and Brian Malfoy for helping to make my dreams come true. Thank you to Erich Brandkamp, Kelly Foulds and Stacy Pisani for all your talent and patience. This would have never have happened without you. Thank you also, to everyone who has ever played with us, booked us, and supported us. You have changed my life. To listen to our full-length album STACKED as well as our newest single "Here at Wrockstock", check out our bandcamp page at librarywrock.bandcamp.com. Check out our merch and other crafts at etsy.com/shop/Bibliophile42 .